Check back here for "LIVE COVERAGE!" this Thursday morning beginning @8:45 AM. 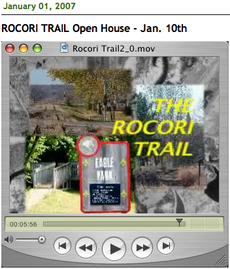 To see other DigElogROCORI ROCORI Trail Stories click on the graphic below. ROCORI TRAIL Ground Breaking :LIVE COVERAGE! On Tuesday, April 10, 2012, the ROCORI Trail Construction Board – covering Rockville, Cold Spring, and Richmond – purchased a large corridor of land from the Burlington Northern-Sante Fe (BNSF) Railroad. The purchase price was $1,298,000 for approximately 1,428,000 square feet, or about 33 acres, of land from BNSF. The land covers a corridor from 178 Avenue North between Richmond and Cold Spring and runs just to the east of the Sauk River in Cold Spring. This represents phase 1 of a three-phase trail project that will eventually run all the way through Rockville to Suburban Raquet Club. The funding of this purchase and the upcoming construction project was made possible through more than $2 million in federal and state grants, monies from the three cities and Stearns County, and many generous donations. Without delay, the railroad ties on the west end of the project are coming out today, which signals the start of construction of the largest section of the Rocori Trail to date (Rockville’s downtown portion was built in 2009). Paving the trail and preparing safety features to the Sauk River Bridge are the next steps, and this phase is expected to be completed by the end of this summer. The Trail Board publicly thanks Burlington Northern-Sante Fe Railroad; Roger Schwinghammer at Jones, Lang, and LaSalle for representing the Railroad; the officials at Stearns County involved in this joint process; Adam Ripple of the Rinke Noonan Law Firm; Heidi Peper and Scott Hedlund of Short Elliot Hendrickson; and all of the donors and volunteers to date that have made this trail process come to life. The Rocori Trail Committee is made up of representatives from all three cities, the County, the DNR and consultants – many of whom have been on board since 2003 – nine years of monthly or so meetings! Your service is greatly appreciated! 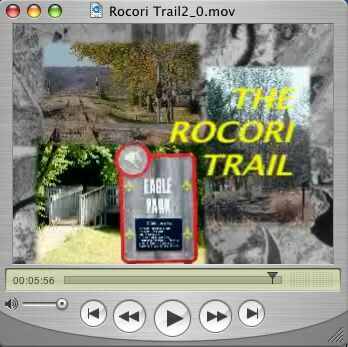 In this story you will hear from Cold Spring City Administrator Larry Lahr as he gives us another ROCORI Trail Project update. Just recently, Governor Tim Pawlenty approved more funds to be allocated to the ROCORI Trail Project. This is significant news because due to the financial status of the state of Minnesota, Pawlenty was forced to veto many trail project requests. Watch this story to learn more about what is going on with the trail. The ROCORI Trail Project recently received another big boost a couple by the Minnesota Legislature and Governor Tim Pawlenty. The bonding bill pass by the legislature and signed by the Governor included $372 thousand for the ROCORI trail project. This is in addition to the federal grant of $526 thousand received a couple years ago. The project will expand the trail from Richmond through Cold Spring to Rockville, connecting with the Glacial Lakes Trail, the Beaver Island Trail, and the Lake Wobegon Trail. Once completed the total ROCORI trail length will be 12.2 miles. This story includes a recent ROCORI Trail committee meeting where the steps to making the trail a reality by 2010 were further delineated. Phase one of the project will create a paved trail along the present railroad bed beginning at the Sauk River bridge in Richmond and ending in downtown Cold Spring. Six blocks of the trail was constructed in downtown Rockville during the summer of 2007 as a part of the highway 23 turn back project. What do the cities of St. Joseph, Albany, Avon, Holdingford and St. Cloud have that residents in Cold Spring, Richmond and Rockville wish they had? The answer is recreational trails. The wishes of our community residents will soon become a reality as our leaders take action to make this wish a come true. The Rocori Trail Committee will be holding an informational public meeting on Wednesday, January 10th at 7:00 p.m. at the Rocori High School Cafeteria to discuss the trail project. The meeting will begin with an overview presentation from the project engineer. There will be a panel of representatives from local agencies that have been involved in this project or similar projects, who will be available to share their experiences or answer specific questions related to their field of expertise. The panelists include representatives from the Minnesota Department of Natural Resources, Stearns County Parks Department, National Parks Service, and other agencies. These experts will be available to answer questions and address concerns from audience members. After the panel discussion, attendees will have the chance to visit individual organization’s display tables for more information and handouts. Refreshments will be available at the meeting. The proposed Rocori Trail would span a total length of 12.2 miles, starting at the east side of Richmond and ending near Stearns County Road 6 in Rockville. The trail would be constructed in two phases with the first covering from Richmond to Cold Spring and the second continuing from the eastern end of Cold Spring to Rockville. Construction of the trail is scheduled to begin in 2010 with the $526,964 federal grant received from the Safe, Accountable, Flexible, Efficient Transportation Equity Act: A Legacy for Users (SAFETEA-LU). Through the many discussions about the proposed trail, there have been two possible routes identified for the trail to follow. Although the committee has been working towards determining the best route, neither route has been finalized. The first route would have the trail located on the right-of-way for the railway that connects the three communities. The second proposed route would use mostly public right-of-ways, and would likely be located at the edge of the right-of-way in the road ditches. The committee is particularity interested in giving potentially affected property owners the opportunity to provide feedback on these two proposed routes. The Rocori Trail has the potential to not only provide access to one trail, but a whole system of trails in central Minnesota. The Rocori Trail could connect with the Glacial Lakes State Trail which extends all the way from Willmar to the eastern edge of Richmond. There is also the potential for an extension to be made to the east of the Rocori Trail, which could connect with Quarry Park, and through the City of St. Cloud to the Beaver Island Trail. Eventually, the Rocori Trail could even connect to the Lake Wobegon Trail in St. Joseph. The cost to complete the entire trail is quite substantial, but effort continues to find grants to assist in funding. Each City Council of the three cities of Richmond, Rockville and Cold Spring have passed resolutions in support of the Rocori Trail Project and have pledged to contribute a local match of $32,000. These costs are committed on the condition that grant funding is secured to fund the balance of the project costs. The committee hopes to be awarded grants through the federal government and the State of Minnesota. In addition to these funds, area cities hope that successful community fundraising efforts will reduce the cost to local governments even further. Attending this open house will keep you informed on the progress of this area community project. Just as importantly, it will give citizens an opportunity to ask questions and share opinions they might have about the Rocori Trail project. Don’t miss this opportunity to learn about what exciting changes are coming to your community in the future by attending this meeting. Click either the photo or "QUICKTIME" to see a short video on many of the key trail development facts and ideas. 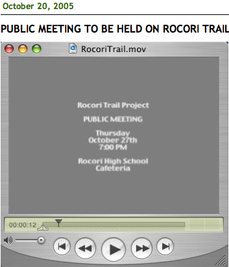 The Rocori Trail Committee held an informational public meeting on Thursday, October 27th at 7:00 p.m. at the Rocori High School Cafeteria to discuss the trail project. About 60 persons attended the meeting which began with an overview of the project by Heide Pepper with Short Elliot Hendrickson Inc. There was a panel of representatives from federal, state and local agencies that have been involved in this project or similar projects, who were available to share their experiences or answer specific questions related to their field of expertise. The panelists included representatives from the Minnesota Department of Natural Resources, Stearns County Parks Department, National Parks Service, the State Bike Advisory and the Rocori School District. These experts addressed various audience questions and concerns. After the question/answer session, attendees will have the chance to visit individual organization’s display tables for more information and handouts. Participants also enjoyed refreshments including trail mix and beverages. The proposed trail would span a total length of 12.2 miles, starting at the east side of Richmond and ending near Stearns County Road 6 in Rockville. The trail would be constructed in two phases with the first covering from Richmond to Cold Spring and the second continuing from the eastern end of Cold Spring to Rockville. The committee estimates the earliest that construction could begin on the first phase would be 2008, with the second phase beginning in 2009. Through the many discussions about the proposed trail, there have been two possible routes identified for the trail to follow. Although the committee has been working towards determining the best route, neither route has been finalized. The first route would have the trail located on the right-of-way for the railway that connects the three communities. The second proposed route would use mostly public right-of-ways, and would likely be located at the edge of the right-of-way in the road ditches. The estimated cost for phase one of the trail is $784,957, and $1,021,925 to complete phase two. Each City Council of the three cities of Richmond, Rockville and Cold Spring have passed resolutions in support of the Rocori Trail Project and have pledged to contribute a local match of $32,000. These costs are committed on the condition that grant funding is secured to fund the balance of the project costs. The committee hopes to be awarded grants through the federal government and the Minnesota Department of Natural Resources. In addition to these funds, area cities hope that successful community fundraising efforts will reduce the cost to local governments even further. 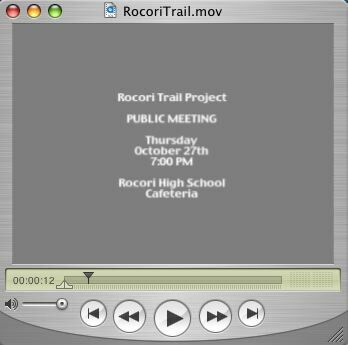 The Rocori Trail Committee will be holding an informational public meeting on Thursday, October 27th at 7:00 p.m. at the Rocori High School Cafeteria to discuss the trail project. The meeting will begin with an overview presentation from the project engineer, Short Elliot Hendrickson Inc.
Next, there will be a panel of representatives from local agencies that have been involved in this project or similar projects, who will be available to share their experiences or answer specific questions related to their field of expertise. The panelists include representatives from the Minnesota Department of Natural Resources, Stearns County Parks Department, National Parks Service, and City Administrators from Richmond, Cold Spring and Rockville. These experts will be available to answer questions and address concerns from audience members. Finally, after the panel discussion, attendees will have the chance to visit individual organization’s display tables for more information and handouts. Refreshments will be available including trail mix and beverages.